MCMINNVILLE—Kyle Hooper wanted to get on the podium and make a statement for the McNary swim team at the Greater Valley Conference Championships. 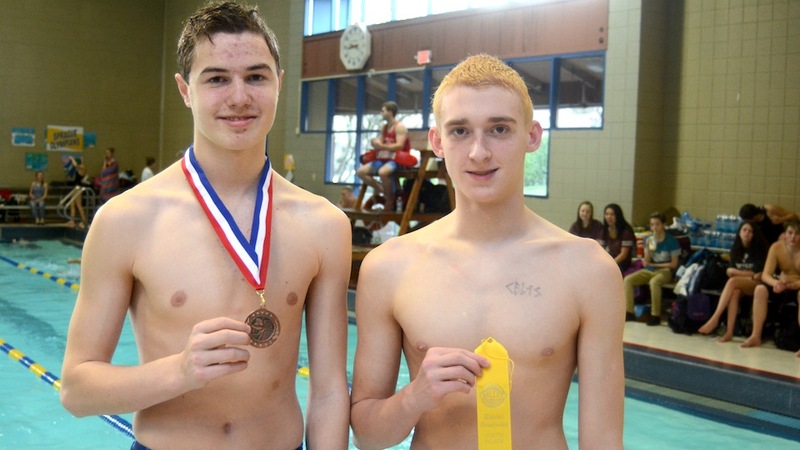 With the help of his teammates, he got there, finishing third in the 500-yard freestyle and fourth in the 200 individual medley Saturday, Feb. 10 at the McMinnville Aquatic Center. Hooper and Vaughn got to A Finals of the 500 free by finishing first and second in Friday’s prelims. Motivated to beat Sprague senior Colby Evenson, who swam a record 4:49.96 at the district meet last year, Vaughn dropped more than 14 seconds from his best time, finishing in 4:58.93, to place first. In finals, Vaughn clocked his first 100 in a blistering 53 seconds before falling back to fifth and finishing in 5:03.12. Hooper said he also started too fast, finishing his first 100 in 55 seconds. Hooper slowed down but finished strong in 4:58.95, a nearly 4 second personal record. Evenson won the race in 4:50.64. West Salem sophomore Marcus Ramirez took second in 4:58.13. Hooper, a sophomore, swam the 500 free in 5:13 at least year’s district meet. Swimming against Vaughn, a teammate at both McNary and Mid-Valley Aquatics, everyday has made him faster. “We’re always racing each other and always pushing each other in practice to get better and get results like this,” Hooper said of Vaughn, who also finished ninth in the 100 breaststroke in 1:05.61. McNary opened Saturday’s competition by placing fourth in the girls 200 medley relay as Alex Beard, Bella Beard, Emily Alger and Haley Debban finished in 200.80. Alex took fifth in the 500 free in 5:35.17 and sixth in the 200 IM in 2:22.12. Bella placed eighth in the 200 free in 2:06.48 and sixth in the 100 breast in 1:13.33. McNary sophomore Alyssa Garvey also made it to A Finals in the 100 breast, finishing eighth in 1:15. Garvey was the only McNary swimmer to advance to A Finals who doesn’t participate on a club team. “I play a lot of other sports, volleyball and track, so I don’t have a lot of time but now I’m thinking of maybe doing a couple of days a week and we’ll see,” said Garvey, who made it to B Finals in both the 50 and 100 free last season but wasn’t able to swim breast due to a knee injury. “It feels awesome to be swimming my stroke again,” said Garvey, who also swam in B Finals of the 100 free on Saturday, finishing with the 10th fastest time of 59.12. Debban took 12th in 1:00.71. Garvey, Debban, Alex and Bella placed sixth in the 200 free relay in 1:46.96. Hooper, Vaughn, Jabez Rhoades and Wyatt Sherwood finished fifth in the boys 200 free relay in 1:35.87. Hooper, Rhoades, Grant Biondi and Brock Wyer took sixth in the 400 free relay in 3:40.62. Individually, Wyer dropped more than 5 seconds in the 100 backstroke to place 10th in 1:04.92. Rhoades finished ninth in the 100 free in 52.66 and 10th in the 50 free 24.29. Lewin told the kids to give it all they had in Friday’s prelims or there wouldn’t be a Saturday final. All five McNary swimmers that made it to finals, Hooper, Vaughn, Alex, Bella and Garvey, should be back for the Celtics next season. “We’re losing a couple of swimmers but we have people right in the wings that will step right in and be as fast or faster,” Lewin said.